Bit.Tube is a decentralized video platform that sets itself apart from YouTube, Dailymotion and other online platforms by not serving any ads. They already have a video platform in your browser and an app for iOS and Android devices. An app for Mac OS, Linux and Windows is still in development. The network for Bit.Tube is being build by miners. They are mining TUBE. A portion of the mined TUBE is being allocated to both creators and viewers. Viewers are being paid in TUBE to watch and interact with content, while content creators are being paid for the time their content is being watched, and they can receive tips from their viewers. As a result, ads are not needed. All people interacting with Bit.Tube are using TUBE to judge content and create value by uploading videos or watching them. We all know the saying “Time is money”. Well, basically TUBE is the monetization of time. The longer people watch your content, the more TUBE you will earn. The more content you’re actively watching, the more TUBE you will earn. You earn TUBE for spending time on Bit.Tube. Wallets are available in your browser on the Bit.Tube platform, in the Bit.Tube Airtime extension (more about that later), on your mobile devices, and of course for your desktop. All videos uploaded to Bit.Tube are uploaded to the IPFS network. Basically this is a open source, P2P protocol that’s designed for distributed storage of any type of content. To some extend you can compare IPFS with Bittorrent, as content is stored on multiple locations and organically shared across the planet. This way censorship is not possible, even though Bit.Tube will remove violent or pornographic content. Bit.Tube uses a database to connect with multiple points in the IPFS network, data is then loaded from the network and shown in your browser. All content you upload to Bit.Tube will always be stored on the IPFS network, even when you unpublish it from the website. When you or someone has the correct hash, the data can be found. You can edit data, but the original version will always be there. AirTime is the measurement Bit.Tube is using for the time users are active on the internet. This can be on Bit.Tube, but also somewhere else on the web. Let’s first talk about the Bit.Tube platform and how the TUBEs are being split between all participants of the network. Currently miners create 26.6 TUBE per 2 minute block. 70% goes to the miners, while 30% goes to the viewers and content creators. From that 30% the biggest part goes to the content creators, while the rest goes to the viewers. The most interesting thing about AirTime, is that it’s not limited to the Bit.Tube platform. Their is an early version of the Bit.Tube browser extension out for Google Chrome and the Brave browser. This extension allows you to monetize your internet activity. You can earn TUBEs from being active on the internet, block ads while still monetizing publishers, and donate TUBEs to content creators you like on Twitch, Twitter and other social platforms. 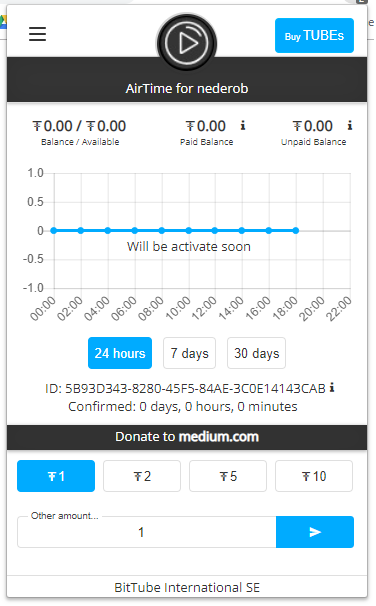 Currently — at the time of writing — Airtime is not active yet. The system is learning to avoid awarding fraudulent behavior. Bit.Tube is still in its early stages of development. The content offering is very small and not very diverse, while the interface itself is quite similar to YouTube’s. One problem is the Bit.Tube web wallet that’s incorporated into the website. This wallet synchronizes when you want to load it, and as it needs to load all previous blocks on the blockchain this can take a while. A more user friendly approach is needed to make this truly mainstream. Another problem is the many Bit.Tube versions there are. 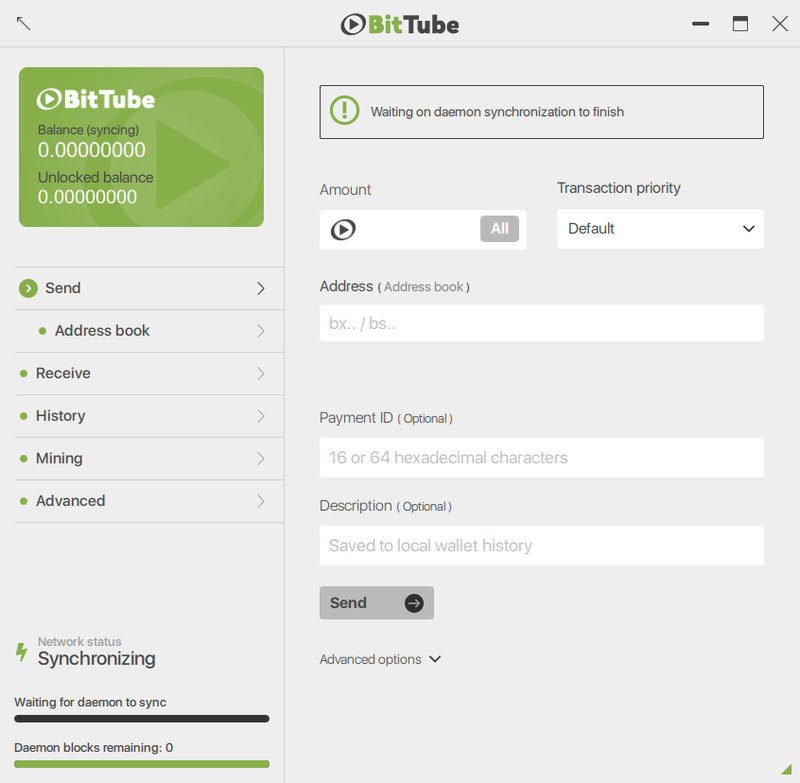 Currently I have four Bit.Tube addresses: desktop wallet, Bit.Tube platform account, the mobile app and the AirTime browser extension. A smoother way to connect these tools together and create one umbrella, would be nice. Like I said before, Bit.Tube is really in its early stages. It’s easy to criticize the website’s aesthetics, but the tech is really cool. AirTime will launch before the end of 2018, which would be a major milestone. I can’t wait to see where things are going for the platform. One of the worries I keep having, is the rise of junk content. There’s a variety of easy content that’s very likely to make a jump to Bit.Tube. Music content with thumbnails of pretty girls (probably unlicensed usage) is something we can already find, but illegal sports footage, viral video compilations and other comparable footage is on the doorstep. How will Bit.Tube battle plagiarism? What about copyright issues, when content will always exist on the IPFS network? I don’t have answers, but those are questions that need answering when Bit.Tube is going to reach out to the mainstream. IPFS network is a great way to keep content online despite location based government censorship. It’s impossible to predict that Bit.Tube will replace YouTube, because that seems very unlikely. But this decentralized video platform will grown and will gain a market share. It’s something I’m very excited about, even though I do worry about the earlier mentioned copyright protection issues.